American DJ WiTech 8 Wireless Controller DJParts - All Variety of Parts that DJ Needs. 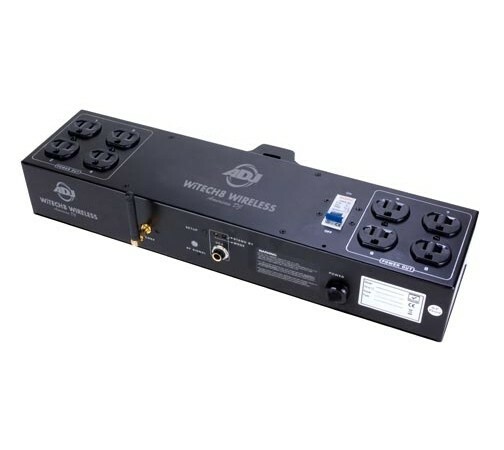 Specifications: • 8 Channel Wireless On/Off Controller • Includes wireless remote: Control Each channel On/Off, All On, Stand By (Black Out), Function and Mode for each channel just like the standard UC3 controller • 1/4-inch connection for UC3 controller input • 16A resettable Circuit Breaker • Includes hanging bracket • Includes one 10-foot 1/4" stereo TRS cable • Wireless Transmitting Distance: 325 ft. /100M • Frequency: 433.9Mhz RF (Radio Frequency) • Maximum Load: 5A per channel, 15A total at a time • Power: AC 120V/60Hz • Dimensions (LxWxH): 16.75”x 4.25”x2.5” / 423x106x66mm • Weight: 6 lbs. / 2.7 kg.